Get access to 'The Service Call Blueprint' and boost your technicians' confidence and revenue! Get access to 'Passing the Baton' and learn how to book and dispatch the service call for maximum revenue! I Have an Appointment. Now What? Gratitude is the quality of being thankful, and a readiness to show appreciation and return the kindness. It stems from considering what you’re grateful for in your life. It is easy to focus on the negative aspects, and in turn, complain and criticize, yet it doesn’t have to be like this. If you change your thoughts and focus on what’s good in your life, you’ll remove yourself from this hole. 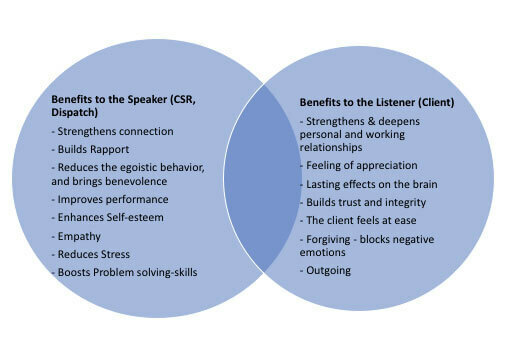 Gratitude when expressed sincerely and genuinely presents significant benefits to both the speaker and the listener. However, mouthing thank you is not enough. Gratitude is a condition of the heart, and If, under challenging circumstances, you can reach down and think about what you have, you can experience peace and joy in the process of the struggle. In the context of the inbound call, gratitude brings benefits to the speaker and the listener, and it troubles me how infrequently many of my clients express gratitude to their customers. Expressing gratitude enables the sales process to thrive. In the context of the inbound call – the first step gratitude brings benefits to the speaker and the listener, and it troubles me how infrequently many of my clients express gratitude to their customers. This sincere expression of gratitude has benefits for both the speaker and the listener. The first step in this process in the HVAC and plumbing industry is answering the telephone. The inbound call is an opportunity to express gratitude to you prospect, client or customer and this opportunity is sadly missed in too many call centers. Fixing the Incoming Call Process. A client approached me to “fix” his incoming call process. He was recording the calls that came from internet searches, and he was not pleased with the process. I’ve created an eCourse, How to Book the Inbound Call, and the client’s CSRs took the course, we wrote a script, and then they implemented it on the phone. Our script starts like this. Internet Prospect: How much is a service call? In our industry that’s the typical question. But the question could be “Do you deliver pizza?” The response works across sectors. CSR: Thank you for calling, I can certainly help you. Have we been to your home before? Look closely at that first sentence; We expressed gratitude and affirmed the caller. In other words, you’ve reached the right person, and we appreciate you reaching out to us. While I can’t listen to every call, Natasha, who works for me remotely from Ukraine, keeps a scorecard on each call. In most calls, the CSR neglected gratitude – even when gratitude was clearly on the script. It was clear: the CSRs didn’t understand the value of gratitude, so I set the top-offenders a project to research the benefits appreciation can bring. How many of us could use a prospect who is more forgiving, more relaxed, less stressed and more outgoing? Any sales trainer will say how important it is to build a trusting relationship, but how do we achieve that? One simple way is through expressing gratitude. Gratitude creates positive emotions, such as those mentioned in the diagram, blocking negative emotions and demonstrates appreciation where the listener feels valued. From my experience, genuine gratitude brings joy. Sincere gratitude is a tool that can do all of this. All that you have to do is take it out of your toolbox and use it. What Does Gratitude Bring to the Speaker? Empathy is an understanding of the prospect’s situation; it joins people together and creates a bond. This validates and affirms the caller which is crucial to connect the speaker and listener. Ultimately, it establishes a relationship that says you understand me. People want to be understood. Gratitude makes the speaker less self-centered. After all, we are there to serve the customer and not ourselves. While we do have boundaries about profits, we must balance the customer’s best interests with our financial goals. If the customer ever senses egoism at play, and that money is more important than their interests, they will leave and go elsewhere. Again, gratitude helps us do this. Gratitude makes the speaker feel good about themselves, enhances self-esteem, and helps the speaker relax during the call. All of these emotional responses to gratitude improve performance. In turn, the feel-good factor reduces negative emotions which are toxic to performance. And now, this brings me to Leonardo da Vinci. When Leonardo da Vinci was working on his painting, The Last Supper, he had become intolerably angry with a certain man. In one instance, he lost his temper, which he expressed through unkind and unfair words. When he returned to the canvas to paint Jesus’ face, he was so enraged that he couldn’t compose himself to continue the painting. Finally, he put down his tools, sought out the subject of his wrath, and asked his forgiveness. The man accepted his apology, and Leonardo could return to his workshop and finish painting. Negative emotions affect performance, even for Leonardo DaVinci, but expressing gratitude removes the negativity. Expressing gratitude makes you feel more optimistic or hopeful. It floods you with a good feeling, and that is how it enhances performance. We are building unity on this team by expressing gratitude to our team. Sincere, genuine gratitude. When you are feeling bad, stressed, and negative about something, change your thoughts. Focus on something that you are genuinely grateful for, and your mood will alter. You’ll find peace, even in when surrounded by unfavorable circumstances. While we cannot control events and circumstances in our lives, we can control our response. It’s a good rule to live by, and I believe this experience illustrates it well. I was driving from the Upper East Side out to Madison, New Jersey to work with a client. The Line to the Lincoln tunnel was packed. Traffic on the I-95 was at a standstill; I was stressed and complaining, which lead me to a bad place emotionally. I couldn’t do anything about the line of cars in front of me, but I could choose what to think about. I started to think about how grateful I was for this consulting gig and thankful for the check it would bring in. In just a few minutes the traffic became a minor inconvenience to a great day. The salespeople who can control their outlook are the better salespeople. One of the differences between top producers, campers and quitters is this: Top producers are like Teflon. The bad events don’t stick to them. They rarely complain about leads or make excuses. They have an attitude about the lead known as we’ll see. Campers and quitters complain and blame others. The leads are no good; this neighborhood is terrible; nothing good comes out of these types of leads. I don’t know why they send me here. This is going to be another terrible call. In sum: No gratitude! As a result, they fret which leads to poor results. Whether during the first call or canvassing, we should always express gratitude to the customer. Uttering the word thank you isn’t enough. Gratitude is an emotion of the heart and therefore, is expressed from the heart. You imitate gratitude. If you do, your words carry no weight. Communicating Gratitude at the Door on a Service Agreement Fulfillment. And, from a sales lead from the internet. Salesperson: Mrs. Jones, I am Roger with ABC Heating and Cooling. Thanks for having us out. I can see that you found us online and I know there are a lot of choices out there. I really appreciate you picking us and giving us an opportunity to earn your business. Thank you. Expressing gratitude facilitates a feeling of peace and joy. How many of us could use a dose of this? It is my belief that most Americans are driven by a need to perform and achieve. What’s more, I believe that this drive is financial gain. Please don’t misunderstand me. There is nothing wrong with money, but the wealth is not going to bring peace. Gratitude brings peace. You can be broke as a church mouse, and have peace. You can be wealthy, and be afraid of losing it all. Cultivate gratitude because it is like medicine to the mind, will, and emotions. Roger Daviston is a personal growth consultant who gets measurable results. He facilitates and encourages individuals to change behavior and make different choices to achieve better outcomes. Copyright 2018 by The Daviston Group. All Rights Reserved.